Doctor Who Gets All Seven Doctors — Plus A Prince? The next time we see the TARDIS, the impossibly capacious time machine in the BBC's Doctor Who, it'll once again be crammed to the rafters. 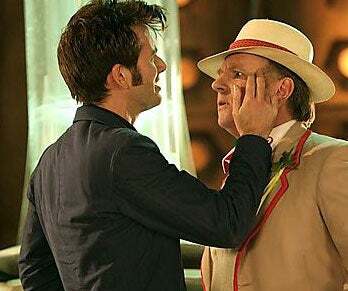 But this time, the crowd scene will be all actors who have played the Doctor, the show's enigmatic alien time traveler. The Telegraph and various other news sources are reporting that all of the surviving Doctors will return for a special mini-episode for the Children In Need charity night, along the lines of last year's "Time Crash" featuring 1980s Doctor Peter Davison. And meanwhile, news sources are reporting that star David Tennant will stay until 2011, and an even more impressive guest star could be joining the series soon. Who could be more impressive than Tom Baker? Try Prince Charles. According to Reuters, a spokesperson says it's possible that the Prince could put in an appearance on Doctor Who next year. Outgoing showrunner Russell T. Davies had asked for the Prince to appear, but he originally turned down the offer, prompting RTD to call HRH "a miserable swine." But now a Palace official says the Prince never even saw the request, which was rejected by an underling along with thousands of others. And if the BBC resubmits the request, the Prince's staff wouldn't rule out his saying yes. (But it's probably a good idea to leave out the "miserable swine" stuff on the invite.) Meanwhile, I have a few thoughts about the rumored multi-Doctor special: 1) First, it's weird to think that Davison will be the only Doctor at this gathering who appeared in the last several-Doctors story, 1983's "The Five Doctors." Davison's predecessor, the manic Tom Baker, skipped "Five Doctors" and was only represented by some footage from an unaired episode. The other Doctors from that story are sadly no longer with us. Actually, I've just realized this isn't true: the surviving Doctors all came back for another Children In Need special, the horrendous 1993 story "Dimensions In Time."